Help us raise money to provide disabled vets and their family members sporting opportunities that will help them heal. All services for disabled vets and their family members are free. In the winter we provide skiing and snowboarding and in the summer we provide waterskiing and cycling. Bike 1 mile or 40 miles - your choice. Sign up as an individual or a team/family. T-shirt provided to those who meet the minimum fundraising goal of $100 per individual or $500 per team/family. Can't join us? Consider joining the Virtual Team. Ride your stationary bike or count up all your bike rides this season. Join the Vitual Team Here. If you do not have a team or want to participate as an individual, choose Team Two Top when registering. Snacks, drinks, riding numbers and a finale lunch will be provided. The Western Maryland Rail Trail (WMRT) is a recreational, paved, linear trail opened to the public for walking, running, biking, and inline skating. The trail is suited to anyone seeking a pleasant, leisurely outdoor experience. The easy grade and paved surface make this trail ideal for families, the elderly, and persons with disabilities. The WMRT is wheelchair accessible. 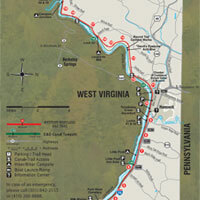 Trail access starts at Fort Frederick State Park and ends at Woodmont Rd. (Pearre). and is 21.8 miles long. The elevation gain is 262 feet.